NAOMI KLEIN: WE CAN SAVE OURSELVES, BUT ONLY IF WE LEARN TO WORK WITH NATURE | "Global Possibilities"
The author and social activist introduced a Vatican conference linking the Pope’s climate encyclical to the key U.N. conferences later this year. 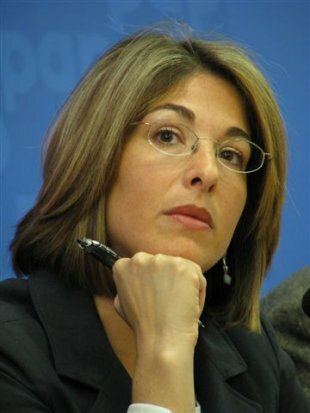 Naomi Klein spoke at the Vatican on July 1 introducing People and Planet First: the Imperative to Change Course at a high-level meeting to explore Pope Francis’ encyclical, which was released on June 18. Here’s the video of the full press conference. Other speakers included Prof. Ottmar Edenhofer, co-chair of Working Group III of the Intergovernmental Panel on Climate Change and Bernd Nilles, secretary general of the International Alliance of Catholic Development Organisations. Thank you. I want to extend my heartfelt gratitude to the Pontifical Council for Justice and Peace and to CIDSE for hosting us here, and for convening this remarkable 2-day gathering that I’m very much looking forward to. It’s also a real honour to be here supporting and indeed celebrating the historic publication of the Pope’s encyclical. Pope Francis writes early on that Laudato Si’ is not only a teaching for the Catholic world but for “every person living on this planet.” And I can say that as a secular Jewish feminist who was rather surprised to be invited to the Vatican, it certainly spoke to me. “We are not God,” the encyclical states. All humans once knew this. But about 400 years ago, dizzying scientific breakthroughs made it seem to some that humans were on the verge of knowing everything there was to know about the Earth, and would therefore be nature’s “masters and possessors,” as René Descartes so memorably put it. This, they claimed, was what God had always wanted. That theory held for a good long time. But subsequent breakthroughs in science have told us something very different. Because when we were burning ever larger amounts of fossil fuels—convinced that our container ships and jumbo jets had leveled the world, that we were as gods—greenhouse gases were accumulating in the atmosphere and relentlessly trapping heat. And now we are confronted with the reality that we were never the master, never that boss — and that we are unleashing natural forces that are far more powerful than even our most ingenious machines. We can save ourselves, but only if we let go of the myth of dominance and mastery and learn to work with nature—respecting and harnessing its intrinsic capacity for renewal and regeneration. For some who see interconnection as a cosmic demotion, this is all too much to bear. And so—actively encouraged by fossil-fuel funded political actors — they choose to deny the science. But that is already changing as the climate changes. And it will likely change more with the publication of the encyclical. This could mean real trouble for American politicians who are counting on using the Bible as cover for their opposition to climate action. In this regard, Pope Francis’s trip to the U.S. this September could not be better timed. That warped value system is how we ended up with ineffective carbon markets instead of strong carbon taxes and high fossil fuel royalties. It’s how we ended up with a temperature target of 2 degrees which would allow entire nations to disappear — simply because their GDPs were deemed insufficiently large. That doesn’t mean gambling the future on the boom and bust cycles of the market. It means policies that directly regulate how much carbon can be extracted from the earth. It means policies that will get us to 100 per cent renewable energy in 2-3 decades — not by the end of the century. And it means allocating common, shared resources — like the atmosphere — on the basis of justice and equity, not winners-take-all. That’s why a new kind of climate movement is fast emerging. It is based on the most courageous truth expressed in the encyclical: that our current economic system is both fueling the climate crisis and actively preventing us from taking the necessary actions to avert it. A movement based on the knowledge that if we don’t want runaway climate change, then we need system change. And because our current system is also fueling ever widening inequality, we have a chance, in rising to the climate challenge, to solve multiple, overlapping crises at once. In short, we can shift to a more stable climate and fairer economy at the same time. What we must always remember is that it’s not too late to veer off the dangerous road we are on—the one that is leading us towards 4 degrees of warming. Indeed we could still keep warming below 1.5 degrees if we made it our top collective priority. But difficult is not the same as impossible. And giving up in the face of a task that could save countless and lives prevent so much suffering — simply because it is difficult, costly and requires sacrifice from those of us who can most afford to make do with less — is not pragmatism. This, it must be said inside these hallowed walls, is pure nonsense. “Perfect” left the station in the mid-1990s, after the first Rio Earth Summit. Today, we have only two roads in front of us: difficult yet humane — and easy yet reprehensible. To our so-called leaders preparing their pledges for COP 21 in Paris, getting out the lipstick and heels to dress up another lousy deal, I have this to say: Read the actual encyclical—not the summaries, the whole thing. Read it and let it into your hearts. The grief at what we have already lost, and the celebration of what we can still protect and help to thrive. Listen, too, to the voices of the hundreds of thousands who will be on the streets of Paris outside the summit, gathered simultaneously in cities around the world. This time, they will be saying more than “we need action.” They will be saying: we are already acting. In our locally-controlled renewable energy projects, which are bringing down emissions, keeping resources in communities, lowering costs and defining access to energy as a right. Stefanie Spear is the founder and executive director of EcoWatch and the president of Expedite Renewable Energy.